BVR is located off of highway 52 in the rolling hills of Gem County. It sits on 300 acres of natural grass with clear streams running through the property. We were established in 2010 to address the growing concern about what we are really buying at the store. (I would suggest watching “Food Inc.”) I wanted to provide the healthiest grass-fed beef that I could raise. I also wanted to know that my animals were being raised humanely, and with no hormones, steroids, or antibiotics. I’m a local rancher that now has the desire and experience to bring this natural concept to my community. We encourage our customers to visit the ranch and hand select, for their family, the healthiest meat money can buy. You know what you are eating at Big Valley Ranch. Call to schedule a time to come out to the ranch for a visit. 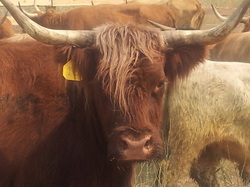 We have Highland cows to feed and pick out. Petting the cows is always one of the best things here at BVR.